✅ UPGRADED 2018 - Our new WiFi Router the Best solution to date extending Wi-Fi to devices like iPhone, iPad, Android devices, Echo/Alexa devices, Smart TV's, PCs, Samsung devices, PlayStation, Smart Plugs and SO MUCH MORE. 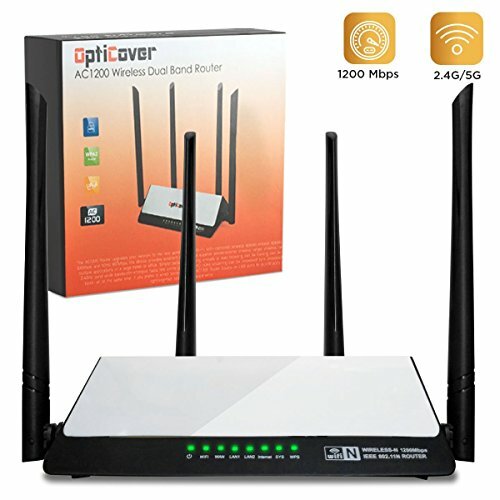 ✅ UNIVERSAL COMPATIBILITY - Wireless Router making it easy to expand and strengthen your network in 2.4 and 5G even as it changes over time.. Delivering AC dual band WiFi up to 1200 Mbps. This Wifi Router is small and discreet, easily blending into your home decor. ✅ SUPER EASY CONNECTION: WPS Button - Easily expand wireless coverage by pressing or browser-based configuration. Router create an instant private wireless network and enable multiple devices to share it. ✅ NO MORE DEAD ZONES - Eliminate dead spots in rooms with weak Wi-Fi coverage with our Wifi router. Network router delivers blazing-fast dual-band Wi-Fi across your home for 4K streaming and gaming in any room. Easy to install and move, the range router enables you to expand your Wi-Fi and connect any wired device, such as your Xbox, PlayStation, PC or Mac, to powerful Wi-Fi with the available Gigabit Ethernet port for boosted speed and performance. ✅ SATISFACTION GUARANTEED: Our team of professionals is constantly working to make you happier. We provide technical support for customers 24/7. We are confident in the quality of our product and give you LIFETIME WARRANTY and great customer support. Click "BUY IT NOW" and ENJOY QUALITY OF OUR WIFI ROUTER. If you have any questions about this product by OptiCover, contact us by completing and submitting the form below. If you are looking for a specif part number, please include it with your message.